Chime Master Electronic Carillons provide churches and civic organizations with an affordable alternative to church bells. All Chime Master Digital Carillons come with hundreds of bell songs and hymns. Traditional Church Bell and Tower Chime sounds are standard. Build a bell ringing system shaped to your congregation or campus needs. Give your church a distinctive voice with the Platinum™ electronic carillon. 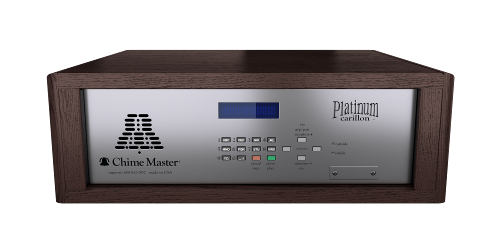 Protected by our 10-year Chime Care™ warranty, the Platinum carillon offers all the features of the Millennium® carillon, enhanced with our ultimate high definition array of bell and chime settings. It comes with a selection of thousands of hymn arrangements, but you can also expand your collection by recording or importing thousands more. Once you’ve selected your musical arrangement, choose from 9 bell sounds to hear it. Enjoy a wealth of sounds at your fingertips. Read more about our Carillon Music Library on our help site. Get the best of both quality and value with the Millennium® electronic carillon. Choose from high-definition bell sounds and thousands of hymn arrangements, in a system protected by our Chime Care™ 7-year warranty. Live keyboard performance can integrate the beautiful sound of bells into your worship. Included is our largest variety of liturgical peals, tolls and individual bells, all customizable with 4 types of bell sounds: English cast bronze bells (both chime and carillon), concert chimes, and concert harp bells. Our highest audio fidelity paired with high-definition speakers creates the convincing sound of cast bells. By adding our Chime Master® bell automation equipment, you can also control any treasured bells you already own. Our Six–SS™ digital carillon provides all of the ringing features that meet the needs of most churches who do not need a keyboard ready performance carillon. It is protected by our 5-year Chime Care™ warranty. It features hundreds of high fidelity recordings of both liturgical bell ringing and beloved hymn selections, available with either the sound of an English Cast Bronze Carillon, or Concert Chime and Harp Bells. Perfect for those looking for the ease of a digital carillon on a budget.